The Airwolf Extended Themes 2CD music soundtrack score was released as a special limited edition release for the Airwolf™ TV series' 30th anniversary in 2014. Featuring 42 brand new tracks from the original 3 seasons of the CBS TV show, the first CD "Main Themes" featuring 22 brand new recordings of variants of the Main Theme song performed and producer by Orchestrator & Associate Producer, Jan Michal Szulew; and the second CD "Episodic themes" by producer, Mark J.Cairns concentrating on the non-Main Theme works by Levay, Harpaz, Freebairn-Smith and Segáll. Only 2000 copies have been manufactured as a Special Limited Edition. 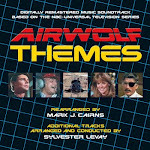 Read the Airwolf fan REVIEWS for the 2CD set here. Airwolf was a show that concerned an iconic, shark-like, supersonic, military helicopter, codenamed AIRWOLF (or known affectionately as 'The Lady' by the characters on the show) and her crew as they undertook various missions, many involving espionage, with a Cold War theme. The series ran for 55 episodes on CBS in the United States in 1984 through 1986, and an additional 24 episodes (called 'AIRWOLF II' aka Season 4), created by a new Canadian cast and production company, aired on the USA Network in 1987, for a total of 79 episodes. But it was the amazing music on Airwolf, composed by Sylvester Levay and Udi Harpaz, that has stayed with the show's fans to this day and especially the memorable main theme tune used in both the opening and closing title sequences and during the aerial battle scenes between the real-life aircraft used on the show, which to many people nowadays symbolizes anything to do with helicopters! When that iconic Main Theme Tune song kicks in, you just know a baddie is going to get it -- from that Blackbird of Death Amalgam of Lone Ranger, Mighty Mouse and God! Airwolf. Airwolf's legacy is that the music, and especially the Airwolf Main Theme Tune stands out simply due to a so-called, tune-of-the-week approach to the music score which transports you to specific scenes, in specific locations, in specific Airwolf episodes, from specific seasons of the show – giving a very unique selling point and quality that makes these collections of Airwolf Themes, especially ‘Airwolf Extended Themes’ such an enjoyable escape to both synthesizer and orchestral music aficionados. The Main Theme song itself really is a piece of iconic music that has transcended above its original intention and stood the test of time by being known by millions of people around the world, both young and old, as the traditional tune (compared to 'Blue Thunder') to sum up the entire, high-flying world of helicopters and some will even say, some of the greatest synthesiser music ever created, especially from the pioneering days of the mid-1980s. To celebrate the release, we're giving away a Special Limited Edition 2CD set of 'Airwolf Extended Themes' to one of our Twitter followers. Winner will be selected at midnight on Saturday 8 November 2014. Terms and Conditions: Employees and contributors of GER Soundtracks, or people associated with the Airwolf Extended Themes music release and their families are not eligible to enter. The judge’s decision is final and no correspondence will be entered into. The prize may not be transferred to any other person. No cash alternative or alternative prize is available on entrant’s request. Entry in the competition implies acceptance of these rules.